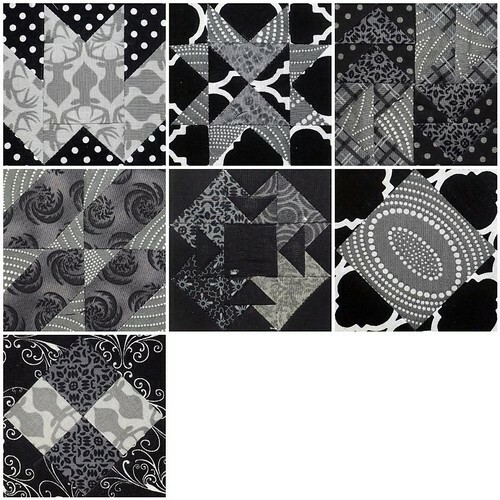 I managed to get away from posting about all of my 365 Challenge Quilt Sampler blocks over the last several weeks. Well, really, from any and all posting. I got a new job! I’m now working in insurance, and it’s been an adjustment, getting used to the commute, the new sleep schedule, etc… I’m packing lunches daily, which is helping me fight the good fight, on the dieting front. Now I just need to add exercise to my daily activities, and I’ll be much happier! 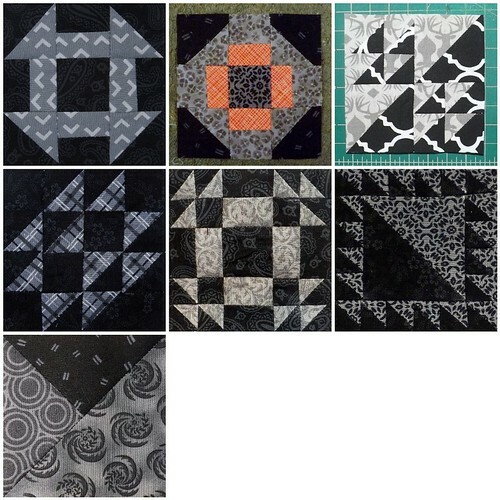 Anyway, I’d been mostly keeping up with the sampler blocks as they were posted, but then I suddenly ended up two weeks behind. I was horribly sick this past weekend with a stomach flu, so I took advantage of my isolation from the world to get through most of them. I got caught up by Tuesday, and then photographed everything for posting. Block number 59, Four Queens, is actually the center medallion for this sampler, and finishes at 18″. We actually had two days to work on that one, which is why there are only six blocks for that week. With this block, I took the opportunity to introduce a lot of low volume prints. As we progress through more blocks, more of these prints will show up as well. 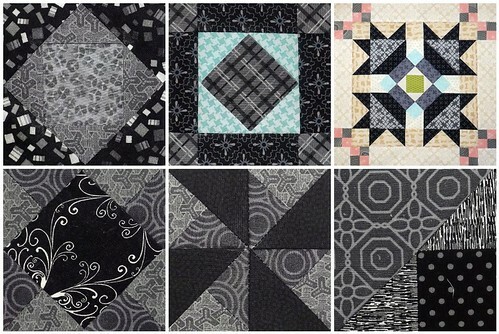 Altogether, I ended up cutting about another half a yard from my stash of black fabrics, to add to the current pool of scraps. I’m starting to see the end of certain fabrics, even from my scrap bins. It’s both sad, and thrilling. Sad, because I love, love, love some of those fabrics. Thrilling because I’m getting every inch I could out of the yardage I purchased. Still, it’ll be fun to play with arranging these blocks. I’m looking forward to getting through these 3″ blocks! Oh my goodness! 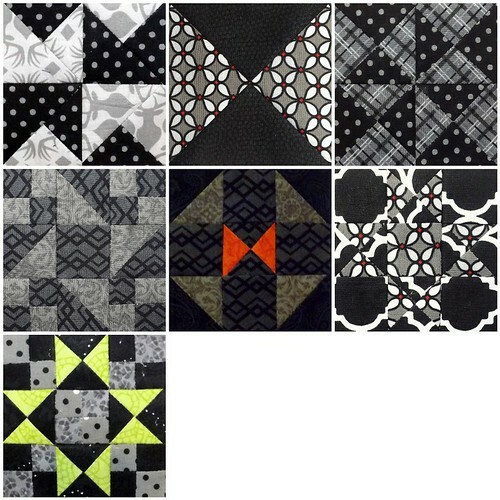 I am diggin’ your blocks! Thank you! I’m having a lot of fun with them. 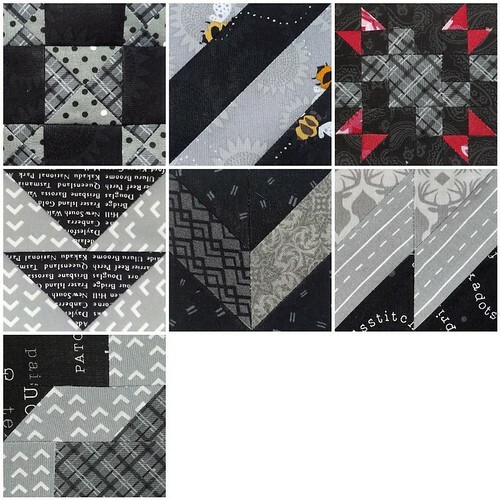 Your block are beautifully sewn and I really like the palette. Hope you are keeping up…I am a week behind as of today Sunday 19th March. I have to admit, I’ve fallen behind again. I think I’ve got two weeks of blocks to catch up on, as of today, Friday, 25 March.